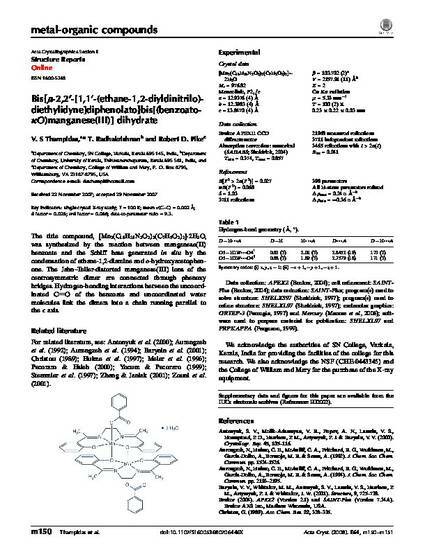 The title compound, [Mn-2(C18H18N2O2)(2)(C7H5O2)(2)]center dot 2H(2)O, was synthesized by the reaction between manganese(II) benzoate and the Schiff base generated in situ by the condensation of ethane-1,2-diamine and o-hydroxyacetophenone. The Jahn-Teller-distorted manganese(III) ions of the centrosymmetric dimer are connected through phenoxy bridges. Hydrogen-bonding interactions between the uncoordinated C=O of the benzoate and uncoordinated water molecules link the dimers into a chain running parallel to the c axis.